Published by the Bedfordshire Archaeological Council in 2017. 294 pages. ISBN 0958-191X Obtainable from The Editor, Bedfordshire Archaeology, c/o Albion Archaeology, St. Mary’s Church, St. Mary’s Street, Bedford, MK42 0AS. This long-awaited volume is a very welcome addition to the literature on the archaeology of Bedfordshire, as is the editor’s intention to publish subsequent volumes every two years. 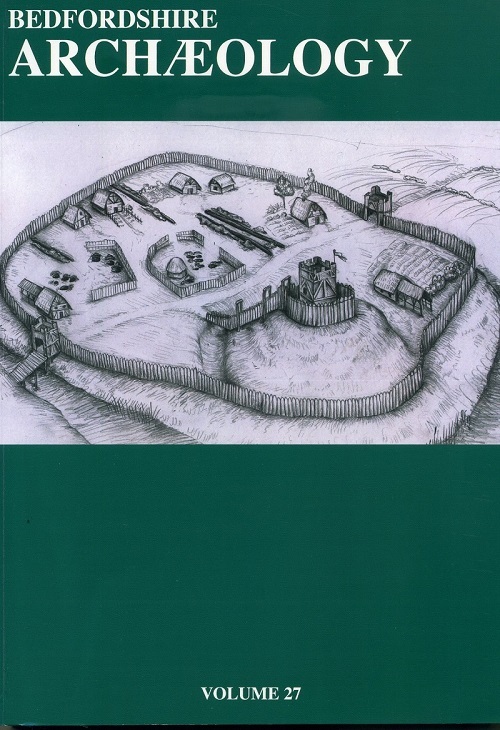 Dedicated to the memory of James Dyer (1934-2013), this edition is packed with 14 articles, spanning the Bronze Age to the late-Medieval, including investigations in and near Bedford (Norse Road, Manton Lane, Elstow, Kempston Box End), Caddington, Harlington, Luton, Marston Moretaine, Stotfold and Woburn. Each article is well illustrated, with photographs, maps and diagrams. Evidence of an early Bronze Age ring ditch which probably surrounded a levelled barrow. Early Iron Age pits and post-holes apparently clustered around the barrow. Two early/middle Saxon pits. C10th-11th field ditches and a trackway, with evidence of a high status domestic building nearby. • Christiane Meckseper & David Ingham An early-middle Iron Age settlement at Norse Road, Bedford (pp. 91-98): Early-middle Iron Age enclosures strung out over 150 metres along the western bank of a tributary to Renhold Brook. Likely to have been used for livestock management. • David Ingham Livestock management at Bedford Academy in the 1st century AD (pp. 105-136): Fascinating investigation of a large site (bounded by Mile Road and Elstow Brook), which revealed part of a late Iron Age to early Roman agricultural settlement, overlaying fragmentary remains of prehistoric fields and late Neolithic activity. Evidence of a complex system of Iron Age interconnecting and subdivided livestock enclosures that were re-worked several times. No buildings were conclusively identified, suggesting that the domestic part of the settlement lay elsewhere. The site was re-used in the early Saxon period for small-scale settlement. • Mike Luke & Tracy Preece Salvage investigations within a Romano-British settlement and cemetery at Kempston Box End, Bedfordshire (pp. 153-202): Rescue excavations at Box End quarry, revealing trackways, a ditched enclosure system, settlement-type features and an inhumation cemetery, all part of the known extensive Romano-British settlement centred on Kempston Church End (known to have covered at least 17 hectares, with at least two large cemeteries). The concluding discussion sets the Box End site in its wider context. It is suggested that Kempston Church End can best be understood as a local centre serving the neighbourhood. The article touches on Dawson’s suggestion that it could have been a veteran settlement, or numbered men who had returned from military service. If you are interested in Romano-British Kempston, this article is an excellent place to start. • Mike Luke, Steven Cockings & Elizabeth Sayer A Roman settlement at Manton Lane, Bedford: report on the archaeological investigations (pp. 203-212): Many BAALHS members have taken a close interest in the emerging finds from the continuing investigation of the Roman settlement at Manton Lane, informed by Steven’s and Elizabeth’s fascinating talks and site tours. Evidence indicates masonry buildings with painted walls, glazed windows, and at least one room with a hypocaust. The presence of stucco work – a rare type of decorative moulding found only at a small number of Roman sites in Britain – suggests that the site may be of high status, possibly a villa or estate centre. Members are asked to note that the article was written directly after the first year excavation in 2013, before the more extensive second excavation, and therefore really only covers the first three small test pits. A lot of work has been done since then, including with many external experts. We await the next instalment! • Christiane Meckseper, Joe Abrams & Tracy Preece. Late Saxon settlement evidence from Norse Road, Bedford (pp. 235-244): Excavations north of Norse Road cemetery revealed a small number of Roman ditches and evidence for medieval agriculture, but most of the features found dated to the late Saxon period, comprising an area of concentrated pitting, with deposits of domestic refuse and waste products from brewing and smithing. Although not of Bedford interest, the volume includes two fascinating articles on excavations of Fulk de Breaute’s castle at Luton. Definitely worth reading, especially if your interest was whetted by the recent coverage in Popular Archaeology.